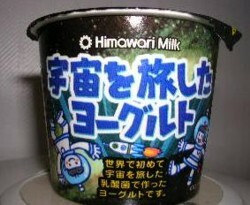 Space Yogurt from Himawari Dairy is now available in Japan. Himawari Dairy, a Kochi-area dairy manufacturer, reserved a seat aboard a Soyuz rocket that took off from Baikonur Cosmodrome on March 31st of this year. The "passengers" were two strains of bacteria: lactic acid bacteria used in ordinary yogurt and a unique strain of Lactobacillus paracasei cultured from pickles preserved in sake lees, which is thought to enhance the body's immunity to disease. Cosmic radiation was expected to have an effect on the bacteria. “Lactic acid bacteria is delicate, so we are looking forward to seeing what happens,” says company president Bunjiro Yoshizawa. “It will be nice if space travel improves the yogurt’s flavor and boosts its immunity-enhancing properties.” After ten days in the harsh environment of rockets and near earth orbit, the samples were returned to the dairy for study. According to Yoshizawa, about half of the bacteria died in the agar medium due to the harsh environment inside the rocket. However, the company claims that the strong, surviving bacteria gives the space yogurt a more full-bodied flavor than commonplace yogurts made with earthbound bacteria. In Japanese, the yogurt is called Uchu O Tabi Shita Yogurt (literally: “yogurt that travelled in space”). You can get some for just one dollar per ninety grams; a space yogurt drink is also available for those on-the-go (astronauts, perhaps?). Interested in unusual food technology stories? A science fiction short story predicted this one; and it looks like a good consumer product. If scientists can just about print organs, I can certainly print myself some bacon. I'm sure you'll enjoy reading about the dozens of science-fictional foods and related stories at Food in Science Fiction. Learn more about space yogurt at Pink Tentacle and in this earlier article.